Asthma - body, last, causes, What Is Asthma? Asthma (AZ-ma) is a condition in which the airflow in and out of the lungs may be partially blocked by swelling, muscle squeezing, and mucus in the lower airways. These episodes of partial blockage, called asthma "fares" or "attacks," can be triggered by dust, pollutants, smoke, allergies, cold air, or infections. When Stacy was young, her parents noticed that she seemed to get tired more quickly than her friends while playing. She also had repeated coughing spells, and her breathing was sometimes noisy. After examining Stacy, asking lots of questions, and having her use a little machine to measure her breathing, the doctor diagnosed her problem as asthma. As part of the way Stacy took care of herself, she sometimes had to take asthma medicine at school. This made her teachers and friends interested in learning more about asthma. When Stacy was 12, she began a schoolwide project with the help of her teacher and the nurse. The goal was to make her school more asthma-friendly. No smoking was allowed, even during after-school events. Extra steps were taken to keep the school as free as possible of things that can trigger asthma flares, such as dust, mold, cockroaches, and strong fumes from paint and chemicals. A plan was set up to let students with asthma take their own medicines at school. Special lessons were offered to all students and teachers about what asthma is and how to help a classmate who has it. The result was a school that was a healthier place not just for Stacy but for everyone. Several changes happen inside the airways in the lungs of people who have asthma. First, there is inflammation, or swelling, of the lining of the airways. Second, the swollen tissues make a thick, slippery substance called mucus (MYOO-kus). Third, the muscles around the airways may squeeze tight, causing the airways to narrow. These three processes—inflammation, mucus production, and muscle constriction—combine to reduce the size (the diameter) of the airways. That makes it harder to breathe, like trying to blow air through a narrow straw. During an asthma attack, these changes get worse. The airways swell on the inside while they are being squeezed on the outside. At the same time, thick mucus plugs the smaller airways. The person may start to make whistling or hissing sounds with each breath. The person's chest may also feel tight. In addition, the person may cough to try to clear the lungs. Asthma attack: 1. Location of bronchial tubes/alveoli. 2. Normal. 3. Inflamed. 4. Bronchospasm with trapped air. known as asthma triggers. There are two main kinds of triggers. The first are allergens (AL-er-jens), or substances that trigger an allergy. Examples of allergens that may trigger asthma are pollens, molds, animal dander (small scales from fur or feathers), dust mites, cockroaches, and certain foods and medicines. Most of these allergy-causing substances enter the body through the air people breathe, but some are swallowed. The second kind of asthma trigger has nothing to do with an allergy but causes the same kind of reaction in the airways. Asthma can be triggered or made worse by irritating substances in the air, such as tobacco smoke, wood smoke, fresh paint, cleaning products, perfumes, workplace chemicals, and air pollution. Some other triggers include cold air, sudden changes in air temperature, exercise, heartburn, and infections of the airways, such as a cold or the flu. Exactly which of these might trigger a reaction varies from person to person. Asthma is one of the most common health problems in the United States. The number of people with the condition has grown rapidly in recent years. The reason for this increase is not yet known. About a third of these people are children under age eighteen. Asthma is more common in African American children than in white children, although the reason for this is not clear. It may have to do with environmental conditions. The degree to which asthma interferes with a person's daily life varies significantly. Some people have ongoing problems. They may have attacks anywhere from a couple of times a week to almost constantly. Their ability to take part in physical activities may be limited until, with treatment, they are able to get their asthma under control. Those with milder problems are usually able to do whatever they want to do, so long as they reduce their environmental triggers, take their medicine as directed, and follow any other advice from their doctors. Babies often wheeze when they have a cold or other infection of the airways, blockage of the airways, or other problems. This symptom may go away on its own with no ill effects. However, if the problem is severe, lasts a long time, or comes back, treatment may be needed. In older children, normal breathing should be quiet. Wheezing may be a sign of asthma, but it can also signal an infection, lung disease, heartburn, heart disease, a blood vessel blocking the airways, or even a piece of food or other object (such as part of a toy) lodged in the airway. In addition to noisy breathing, asthma in children can cause rapid breathing and frequent coughing spells. Parents may also notice that the child tires quickly during active play. Asthma tends to get worse at night. Nocturnal (or nighttime) asthma occurs while a person is sleeping. For some people, nocturnal asthma is one of many symptoms; other people seem to have coughing or wheezing only at night. The word "asthma" comes from the Greek word for "panting," which is a symptom that occurs in several different pulmonary (lung) disorders. Asthma was first depicted as a disease rather than a symptom by the English chemist Thomas Willis (1621-1675). In 1698, Sir John Floyer first gave the first formal account of an asthma attack or "fit." However, an accurate diagnosis of asthma was not possible until the early nineteenth century when the celebrated French physician René Laënnec (1781—1826) invented the stethoscope. During the early nineteenth century, asthma was treated in a variety of ways including whiffs of chloroform and even the smoking of ordinary tobacco. Up to four out of five people with asthma have trouble with noisy breathing during or after exercise. This is known as exercise-induced asthma. Other symptoms include coughing, a rapid heartbeat, and a feeling of tightness in the chest five to ten minutes after exercise. Cold or dry air, high pollen counts, air pollution, a stuffed-up nose, and an infection of the airways are all things that tend to make the problem worse. Types of exercise that may lead to wheezing include running, using a treadmill, and playing basketball—in short, exercises that are aerobic (designed to increase oxygen consumption). Occupational asthma is caused by breathing in fumes, gases, or dust while on the job. Asthma can start for the first time in a worker who was previously healthy, or it can get worse in a worker who already had the condition. Symptoms include wheezing, chest tightness, and coughing. Other symptoms that may go along with the asthma include a runny or stuffed-up nose and red, sore, itchy eyes. The asthma may last for a long time, even after the worker is no longer around the substance that caused it. Status asthmaticus (STA-tus az-MAT-i-kus) is a severe asthma attack that does not get better when the person takes his or her medicine as usual. This kind of attack is an emergency that must be treated right away in a hospital or doctor's office, where other medicines may be used. Allergy tests help identify which things a person is allergic to. Skin tests are most c, ommon. Tiny amounts of possible allergens are put on the skin, and the skin is checked to see which substances, if any, cause a reaction. In another type of allergy test, a blood sample is checked for certain antibodies, which are substances made in the blood to fight foreign or harmful things. People with allergies may have high levels of immunoglobulin E (IgE) antibodies. However, the blood test is generally not considered as sensitive as the skin test, and it cannot check for as many allergens. An x-ray is an invisible wave that goes through most solid matter and produces an image on film. In this case, a special picture is made to show how the lungs look. These tests show how well the lungs are working. In one test, the person blows into a device called a spirometer (spi-ROM-i-ter), which measures the amount of air going in and out of the lungs. Another test uses a peak flow meter to measure how fast the person can breathe air out of the lungs. A peak flow meter is a simple, hand-held device that can be used at home. Many people with asthma use peak flow meters regularly to check for early warning signs of an upcoming asthma attack. This gives them time to take certain medicines that can often stop the attack. A man with asthma uses peak-flow meter. © Will and Deni McIntyre, Photo Researchers, Inc.
Asthma that is not under control can cause many problems. People miss school or work, must go to the hospital, and can even die (rarely) because of asthma. With a doctor's help, though, it is possible to control asthma. People with well-controlled asthma have few, if any, symptoms during the day and can sleep well at night. They can also take part in their usual activities, including sports and exercise. However, the asthma does not go away just because the symptoms do. A person needs to keep taking care of the condition as part of life: avoiding triggers, not smoking, and living in a healthful, clean environment. This is true even if the asthma is mild. Besides avoiding exposure to asthma triggers, the chief way that asthma is treated is with various medicines. One key to good control is taking the right medicine at the right time. There are two main kinds of asthma medicines: those that help with long-term control of the disease, and those that give short-term relief when a person is having an asthma attack. Inhaled corticosteroids (kor-ti-ko-STER-oids). These strong drugs prevent and reduce swelling in the airways. They also make the airways less sensitive to triggers. However, they work only if they are used regularly. These drugs are taken every day by people with long-lasting asthma. They are not the same as the unsafe steroids some athletes use to build muscles. Other inhaled drugs. These medications also help prevent and reduce swelling in the airways and make the airways less sensitive. However, it can take four to six weeks of regular use before they start to work. These drugs are taken every day by people with long-term asthma, but they can also be used before exercise or contact with a trigger. Oral corticosteroids. These drugs are taken by mouth in pill or liquid form. Unlike inhaled corticosteroids, they sometimes cause serious side effects when used for a long time. However, they can often be used safely for a short time to treat severe asthma attacks and to quickly bring asthma under control. They are sometimes taken every day or every other day by people with the most severe asthma. Long-acting bronchodilators (brong-ko-DY-lay-tors). These drugs relax the muscles around the airways, making it easier to breathe. They can prevent or reduce narrowing of the airways. However, they keep working only if they are used regularly. These drugs are inhaled or taken by mouth in a pill. Some are especially useful for preventing nighttime or exercise-related asthma. Antileukotrienes (an-ti-loo-ko-TRY-eens). This is a new class of asthma drugs. These drugs prevent and reduce swelling in the airways and make the airways less sensitive to triggers. They also prevent squeezing of the muscles around the airways. These drugs are taken regularly by mouth in a pill. So far, they have been used mainly for mild asthma in patients of age twelve and older. Allergy vaccines. In some cases, a person's asthma symptoms can be prevented or lessened by giving a course of special allergy injections over months or years. These shots contain small amounts of the allergens that are triggering the person's asthma. The course of injections causes the person to become less sensitive to the allergen when exposed to it. Short-term relief medicines are taken only when needed to relax and open the airways quickly. They can be used to relieve symptoms or to prevent them if a person's peak flow meter readings begin to drop, signaling an upcoming asthma attack. However, the effects last for only a few hours. They cannot keep the symptoms from coming back the way long-term control medicines can. These drugs are inhaled and are taken at the first sign of trouble or before contact with a trigger. Medicines that provide short-term relief of asthma are called shortacting bronchodilators. These drugs relax the muscles around the airways, making it easier to breathe. They begin to work within five minutes, and their effects last for four to six hours. Such drugs are taken right after symptoms start or just before exercise. How Are Inhaled Medicines Taken? Many asthma medicines are made to be breathed into the lungs. Such inhaled drugs go straight to the place where they are needed. The most popular device for taking inhaled medicines is a metered dose inhaler, which gets the drug to the lungs in exact amounts. The inhaler is a small, hand-held canister with a button that the person pushes to make the medicine spray out. Often a tube, called a spacer, is attached to the canister to make it easier to use. More than 17 million people in the United States have asthma. Of these, almost 5 million are children. About one in every ten children has asthma-like symptoms. About three out of four children with asthma continue to have symptoms as adults. Asthma results in about 3 million lost days of work each year among American adults. According to the Centers for Disease Control and Prevention (CDC), between 1980 and 1994, the number of Americans who reported having asthma rose 75 percent. Jackie Joyner-Kersee (b. 1962) has often been called the world's greatest female athlete. What many fans never suspect is that she is also an asthma patient. Joyner-Kersee became active in sports at age nine. As a teenager, she was an all-state player in basketball and a Junior Olympics champion in pentathlon, an athletic contest in which each person takes part in five different events. While still in high school, Joyner-Kersee began having trouble breathing. When she first found out that she had asthma, she did not take it seriously. She often skipped her medicine. After a serious asthma attack, though, she realized that she had to work to control the condition just as she worked to win at sports. After college, JoynerKersee went on to win six Olympic medals as well as to break the world and Olympic records in the heptathlon, an athletic contest with seven different events: 100-meter hurdles, high jump, shot put, 200-meter dash, long jump, javelin, and 800-meter race. Today she serves as a spokesperson for groups that educate the public about asthma. Another type of device that is sometimes used to take inhaled medicines is a nebulizer (NEB-you-lyz-er), which turns liquid medicine into a very fine mist. These devices are helpful for babies, young children, and elderly or very sick adults who would have trouble handling a metered dose inhaler. People with asthma should try to figure out what makes their symptoms worse and take steps to avoid or control those things. Here are a few ways that many people control some common asthma triggers. Not all of them will work for everyone. 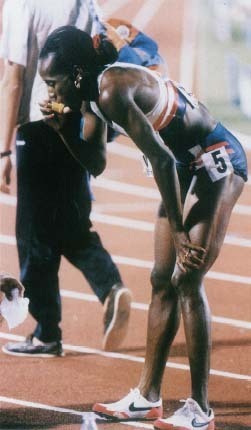 Jackie Joyner-Kersee uses an asthma inhaler after winning the 800-meter race (part of the women's heptathlon) at the World Athletics Championships in Stuttgart, Germany, July 17, 1993.
keep windows and doors closed when pollen or mold spore counts are high. avoid walking in gardens and fields when they are in bloom and when pollen and mold spore counts are highest. ride with the car windows shut and the air conditioner on during pollen season. ask their doctors about starting or increasing a long-term control medicine before peak pollen season begins. fix leaky faucets, pipes, and other sources of water. remove wallpaper, which can have mold growing on it. get rid of houseplants, which can gather mold and dust. keep pets with fur or feathers out of their homes, if possible. have pets stay out of bedrooms, in particular, and keep bedroom doors closed. remove carpets and cloth-covered furniture, or keep pets away from these things. use polyester-fill rather than feather pillows, and avoid down quilts. wash their bedding each week in hot water (it must be hotter than 130 degrees F to kill mites). enclose mattresses and pillows in special dust-proof covers, or wash pillows each week in hot water. remove carpets in bedrooms and those laid on concrete. keep stuffed toys out of beds, and wash the toys each week in hot water. wear a dust mask while vacuuming, or have someone else do the vacuuming. keeping all food out of bedrooms. storing food and garbage in closed containers and never leaving food or crumbs sitting around. using poison bait, powder, gel, paste, or traps (following label instructions) to kill cockroaches. staying out of the room until the odor goes away if a spray is used to kill roaches. tell the doctor about any past reactions to medicines. Smoking is not good for anyone, the person smoking or people who are in the same room with tobacco smoke. People with asthma are especially endangered by tobacco smoke and find it is best not to smoke, to ask other family members to quit smoking, and to ask visitors not to smoke. avoid using a wood-burning stove, kerosene heater, or fireplace, if possible. try to stay away from strong odors and fumes, such as perfume, hairspray, and fresh paint. warm up for six to ten minutes before exercising. avoid exercising outside when air pollution or pollen counts are high or when the air is cold. pick activities that do not cause symptoms; running sports are the most likely to trigger problems. ask a doctor about taking medicine before exercise to prevent symptoms. American Lung Association and Norman H. Edelman. The American Lung Association Family Guide to Asthma and Allergies: How You and Your Children Can Breathe Easier. New York: Back Bay Books, 1997. Weiss, Jonathan H. Breathe Easy: Young People's Guide to Asthma. Washington, DC: Magination Press, 1994. Allergy and Asthma Network/Mothers of Asthmatics, 2751 Prosperity Avenue, Suite 150, Fairfax, VA 22031. American Academy of Allergy, Asthma and Immunology, 611 East Wells Street, Milwaukee, WI 53202. American College of Allergy, Asthma and Immunology, 85 West Algonquin Road, Suite 550, Arlington Heights, IL 60005. American Lung Association, 1740 Broadway, New York, NY 10019. Asthma and Allergy Foundation of America, 1125 Fifteenth Street N.W, Suite 502, Washington, DC 20005. Asthma Information Center. This website is run by the Journal of the American Medical Association. U.S. National Heart, Lung, and Blood Institute, NHLBI Information Center, P.O. Box 30105, Bethesda, MD 20824-0105. NHLBI has an Asthma Management Model System and runs a National Asthma Education and Prevention Program. can you tell me more about why do african americans tend to get asthma than white people? also how does asthma and diabetes connect to one another?